Tualatin Riverkeepers is a community-based organization that protects and restores the Tualatin River watershed. We build watershed stewardship through engagement, advocacy, restoration, access, and education. Thank you for your support! We couldn't do it without you. 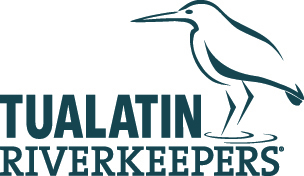 Join Tualatin Riverkeepers - Select your donation amount and frequency and then choose your annual membership benefits. Join Tualatin Riverkeepers and help us to protect and restore the Tualatin River watershed. Being a Riverkeeper is more valuable than ever! Enjoy great annual membership benefits (descriptions below) while being part of the fight for clean water and a sustainable future. Give at the donation level right for you. Donate 100% - Add 3% so that 100% of the donation goes to TUALATIN RIVERKEEPERS. TUALATIN RIVERKEEPERS has partnered with Network for Good to securely process your online credit card payment via Network for Good (tax ID 68-0480736). This transaction will appear on your credit card statement as "Network for Good." This transaction is subject to Network for Good’s Privacy, Security & Disclosure Statement and the Charitable Solicitation Disclosure.